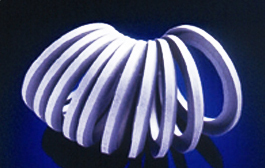 TETRON GR is the trade name for glass/graphite filled polytetrafluorethylene (PTFE). The combination of fillers makes for a chemically inert alloy with excellent wear properties against soft metals. There is also reduced deformation under load at both high and low temperatures. It is an excellent bearing material which is self-lubricating and with low friction properties.